Critics of American foreign policy love to point out instances where our policy reeks of hypocrisy. No current issue in international affairs affords a better illustration of our inconsistent sanctimoniousness than the dispute over competing claims to insular territories (whether to call them “islands” or “rocks” is of great significance, as we shall see) in the South China Sea. Symptomatic of our hypocrisy on this issue, we protest Chinese “aggressive” actions in the area by sailing the Seventh Fleet through the territorial waters of atolls turned into landing-strips to demonstrate our commitment to protecting freedom of navigation. Yet we refuse to sign the UN’s Convention on the Law of the Sea (UNCLOS), the international effort to formalize the rules governing freedom of navigation on the high seas. The convention, which has been around since 1982, has been ratified by over 160 UN member states, including China, but not by the U.S. of A. Opponents of the UNCLOS, like Senators Portman and Ayotte, contend that the convention infringes on US sovereignty, in particular with regard to its provision for international arbitration of disputes (keep that in mind when the Permanent Court of Arbitration rules on a suit brought by the Philippines over China’s claims in the South China Sea). But I believe the main reason for our unwillingness to ratify the UNCLOS lies elsewhere. The convention makes a distinction between “islands”, which can support human habitation, and “rocks”, which cannot. The territorial waters around either type of sea-bound outcrop can be claimed up to 12-miles out, but a 200-mile Exclusive Economic Zone (EEZ) can only be claimed around an island, not a rock. Most of these possessions were acquired in the late 19th century under the Guano Islands Act of 1856. There was a gold rush, so to speak, for guano deposits at the time as the phosphate-rich bird poop was much sought after as a fertilizer. The act authorized any American captain who stumbled on an uninhabited, unclaimed island covered in guano to claim it in the name of the United States. Under the act dozens of islands came into America’s possession, most of which we gave up once an island had been stripped clean, literally. Currently, none of our outlying islands have permanent residents. As can be seen, the EEZs around these outlying “islands” cover a sizeable area. In fact, the projection used causes the EEZs in the South Pacific to look smaller than they actually are compared to zones in more northern latitudes. Just one of the equatorial EEZs, that around the Howland and Baker Islands, is larger than the EEZ off the California coast. Under UNCLOS, many of these “islands” would be deemed mere rocks, not entitled to EEZs. The same is probably true of some of the “islands” in the Aleutian Islands chain. Hence, ratification of the Convention on the Law of the Sea would result in a significant diminution of our Exclusive Economic Zones, something our world-beaters are not likely to agree to readily. Despite the rocky grounds for many of our own claims, we pooh-pooh Chinese claims based on similar grounds. I recently heard a former Deputy Under Secretary of Defense, Kathleen Hicks, belittle China’s claim to the Scarborough Shoal because it is almost underwater at high tide (see this videoat the 2:55:26 minute mark); yet we claim not only the territorial waters but also an EEZ around a reef in the Hawaiian Islands chain, Maro Reef, which is entirely submerged, even at LOW tide. 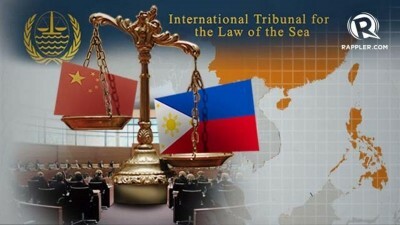 As mentioned previously, the Philippines has taken China to court over its claims in the South China Sea. The court in question, the Permanent Court of Arbitration, is often referred to in the press as a “UN tribunal” to give it greater cachet, but, in fact, it is not part of the UN, being a body created in 1899 when imperialism ruled the waves. No wonder China refuses to participate in the proceedings (a Palestinian in an Israeli court stands a better chance) and will no doubt ignore an adverse ruling. If so, you can count on our media howling about China flaunting the rule of law, how outraged the “the international community” (read “NATO”) is, and the like. Perhaps some courageous, soon-to-be-unemployed journalist will be brave enough to point out that when Nicaragua took us before the International Court of Justice – an actual UN body – over our mining of their harbors and other offenses, we refused to participate in the proceedings, claiming the court did not have jurisdiction. When the court ruled against us, we blocked enforcement of the ruling through our veto in the Security Council. Embarrassingly, in light of current posturing, one of the charges levelled against us was interrupting peaceful maritime commerce – this by the self-proclaimed protector of freedom of navigation in the western Pacific. 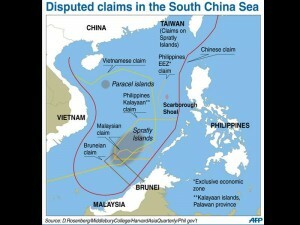 To the uninformed (read “Kathleen Hicks”), it will seem obvious to whom sovereignty over the Scarborough Shoal belongs. Just look at how close they are to the Philippines and how far from China. Ms. Hicks has probably never heard of Navassa Island, another Guano Islands Act possession of ours (see the map of US EEZs above). It lies far from our shores but just off the coast of Haiti, which also claims it. We’ve shown no willingness to give up the former El Dorado of avian defecation simply based on geography. Similarly, when bemoaning how far China’s nine-dash-line delineating its claims in the South China Sea (shown as a solid red line above) extends from the Chinese mainland, we should consider what a line encompassing our own far-flung possessions would look like. Our line, like China’s, would reflect past naval exploits, not proximity to ours or someone else’s coast, and our line would extend much farther from our mainland than China’s does from theirs. 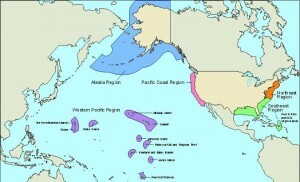 Adopting a conveniently faulty memory, we call for peaceful resolution of the disputes and require all disputants (read “China”) to refrain from aggressive actions, like populating disputed territories, but in 1935 we secretly started placing settlers on Howland, Baker, and Jarvis Islands, former Guano Islands Act possessions long forgotten and by then of lapsed and uncertain ownership. After a year of surreptitious colonizing, President Roosevelt revealed the sneaky scheme and proclaimed the islands American territory. That sort of behavior would not be condoned under the Convention on the Law of the Sea, another reason our wily buccaneers will not sign it. Ken Meyercord is the author of The Ethic of Zero Growth. He is a retiree who lives in the Washington, DC area where he heads up The Iconoclast’s Book Club. He can be reached at: [email protected].